Off Lease Only couldn’t be more thrilled to receive the 2017 DealerRater Used Car Dealer of The Year award for the entire United States! Off Lease Only couldn’t be more proud to announce winning the 2017 DealerRater Used Car Dealer of The Year Award! At Off Lease Only the ONLY thing that matters is impeccable customer service. Winning this prestigious award for the third year in a row is quite an honor. Off Lease Only’s reputation for excellence is what has led this company to their impressive growth. Let’s face it, selling over 4,000 used cars consistently each month would be impossible, without an entire team dedicated to making sure every used car shopper gets the service they want to brag about! Owners Mark & Eileen Fischer have grown Off Lease Only from 2 cars and their wedding money to over 150,000 Happy Customers! Owners Mark & Eileen Fischer started their company with two cars that they bought with their wedding money, and a vision to provide a unique and transparent used car buying experience, unlike any other dealer. Their passion to be different paid off. The owners realize that selling used cars thousands below retail just isn’t enough in this day and age. The incredible customer feedback is the reason why customers feel so confident purchasing a used car at Off Lease Only. Off Lease Only is proud to offer a 10 day/ 500 mile exchange policy for additional peace of mind! 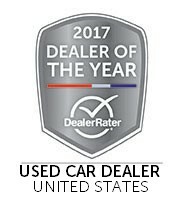 Winning the title of 2017 DealerRater Used Car Dealer of The Year for the entire United States is just another accolade that proves Off Lease Only’s dedication to customer satisfaction is far above and beyond the entire industry. That’s why Off Lease Only proudly offers a 10 day/ 500 mile exchange policy. No questions asked. No reason needed. With thousands of used cars in Off Lease Only’s impressive inventory, you can feel free to simply trade into one that suits your needs more. 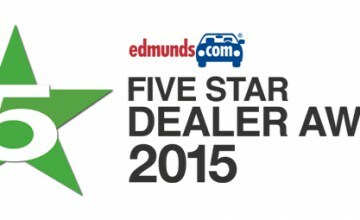 Off Lease Only has over 20,000 customer reviews on DealerRater alone with an impressive 4.9 star rating. “Our team works towards getting the perfect review every time, from every customer, whether they purchase a vehicle or not. It’s all about the experience at Off Lease Only,” said Director of Marketing Monique Hausheer. Typically customers only feel compelled to leave a review when they have had a bad experience. Clearly that is not the case at Off Lease Only. 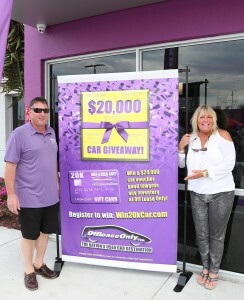 Mark & Eileen Fischer at the Grand Opening of Off Lease Only West Palm Beach. “Our goal is to change the way people feel buying used cars,” said Fischer who reads every single Off Lease Only customer review. Off Lease Only has created a unique and transparent used car buying experience. One where the cars are priced thousands below retail with no hidden fees and no stress of negotiating price. Customers can feel free to shop thousands of used cars for sale online prior to even stepping foot into any Off Lease Only location, and even get pre-approved for financing. 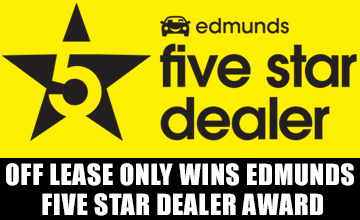 Once you shop at Off Lease Only, you’ll understand why this dealer wins every award associated with customer service. Off Lease Only is light years ahead of the rest. “It’s taken years of dedication to excellence. The processes we have put in place, and the training that we have done has certainly paid off in the most wonderful used car shopping experience of your life,” said Fischer with a big smile. 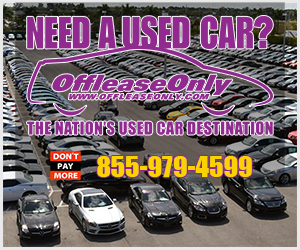 If you need a used car, definitely log onto OffleaseOnly.com to start browsing nearly every make and model used car for sale! 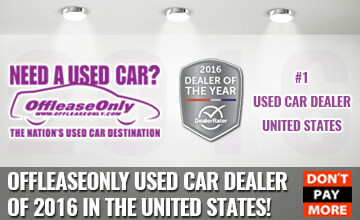 You are sure to see why Off Lease Only continues to win such prestigious awards. 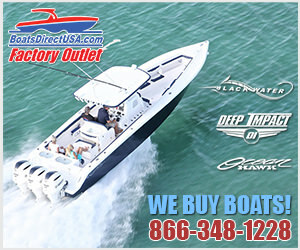 Off Lease Only is also an A+ Rated company on the BBB and an Edmunds Five-Star Dealer. ← Previous Story Last Chance to Register to Win The $20k Off Lease Only Car Voucher! Next Story → OffLeaseOnly Car Donation Huge Success with Best Foot Forward!